Simon here again. We have been getting a lot of questions about having larger rooms, and I know we have mentioned them several times. Well, we figured instead of just talking about it, we should show you. We have a prototype here for your viewing pleasure of the 16 tile room. This version has a single door, but we will have versions with 2, 3 and even four doors. I know a lot of people are wanting these as part of the kickstarter. We are working on it, but we want to focus on pieces that we can provide in the promised time frame. 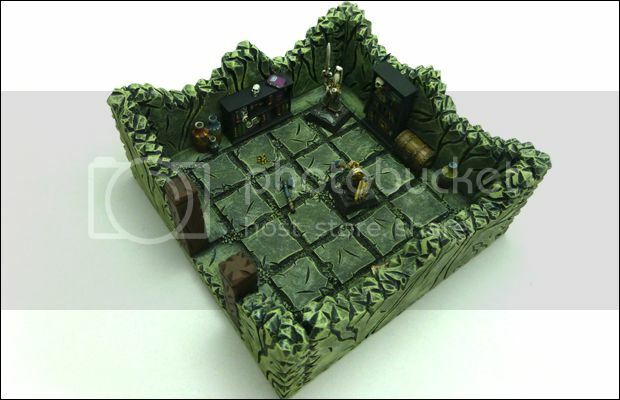 The starter, treasure items and passage ways sets are all completed, ready for production sets that we can get to you if we make our funding thresholds. These larger rooms are the next in line, but may not be production ready before the kickstarter is completed. We don't want to deliver just promises. So we will only offer things as add-ons or pledges that we know we can get to you by the deadline. I know that is disappointing to some people, but I think it would be more disappointing if we got your hopes and up and then failed you. Enjoy! hmm, I couldnt see the photo?